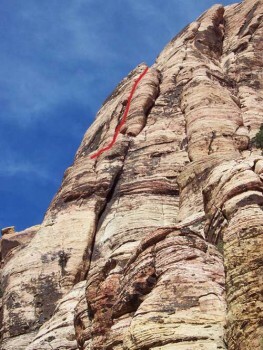 Loose and runout, One-Armed Bandit is typical of much of the less-than-classic routes at Red Rocks. Of course, this also gives you the flavor of many of the classic routes before lots of traffic cleaned them up. Most of the climbing on One-Armed Bandit is fun and well protected, but a few sections of loose and runout climbing make this route a serious undertaking, definitely not suitable for those with little experience on such routes. Which SuperTopo guidebooks include a topo for One-Armed Bandit?